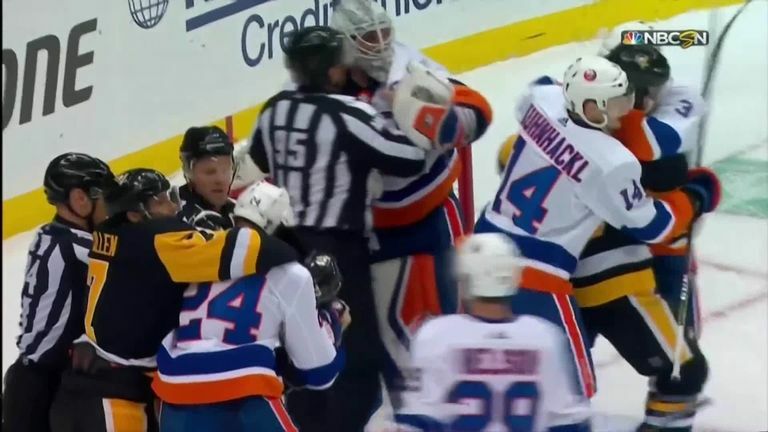 Pittsburgh Penguins winger Patric Hornqvist and New York Islanders goalie Robin Lehner had to be separated after a bust up in their NHL match. Game four of the playoffs was do-or-die with the Penguins facing elimination. The pushing and shoving started in the second quarter which included slashes from Lehner, while Hornqvist looked to drop his gloves and start a full-on fist fight but the officials stepped in to break up the two players. In the aftermath, both players were sent to the sin bin. Lehner's work in goal helped the Islanders record a 3-1 victory and complete a series sweep over Pittsburgh. The Penguins' have a streak of 13 straight post-season appearances - the longest in the NHL - but it didn't prove to be their lucky number this year.